Melbourne Auxiliary Bishop Terence Curtin with Australia’s papal nuncio Archbishop Paul Gallagher and Melbourne Auxiliary Bishop Mark Edwards. “GOOD stock” from Melbourne diocese and the Australian Oblates of Mary Immaculate are Melbourne’s newest auxiliary bishops installed in Melbourne last night. 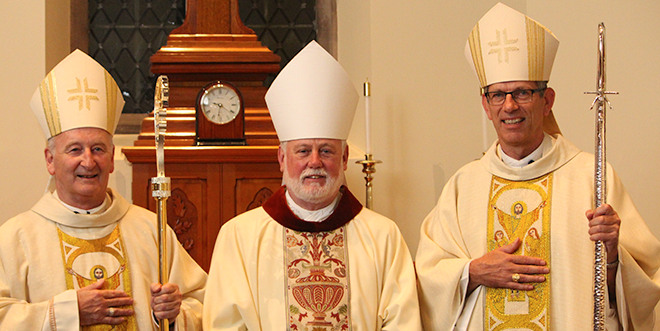 Bishop Mark Edwards, of the Brisbane Oblate community, and Bishop Terence Curtin were ordained as Melbourne auxiliary bishops at an episcopal ordination at St Patrick’s Cathedral, Melbourne on December 17. Bishop Curtin assured the congregation that he and Bishop Edwards were “both from good stock” but would need to be “well planted” into Melbourne. “There lies your task, dear bishops, priests and people of God, to plant us well in the joys, the hopes, the griefs and anxieties of the men and women of our age,” Bishop Curtin said. Bishop Curtin was also ordained Titular Bishop of Cabarsussi and Bishop Edwards was ordained Titular Bishop of Garba (in Numidia). Australian Catholic Bishops Conference and Melbourne Archbishop Denish Hart consecrated the two new Bishops, alongside Australia’s apostolic nuncio Archbishop Paul Gallagher and Brisbane Archbishop Mark Coleridge. Several Australian Catholic bishops, Melbourne archdiocesan priests and priests from religious congregations and visiting priests also con-celebrated. Bishop Curtin said the episcopal ordination was a humbling event that stressed man’s weaknesses and need for God. “‘It has been very humbling because in moments like this, as I think all the bishops would know, you become acutely aware of your own failings and limitations,” Bishop Curtin said. “But that’s not a bad thing. Ahead of his ordination, Bishop Edwards said he was “honoured, excited and sad” to be chosen as a new auxiliary bishop for Melbourne, where he lived as a young boy. “In the end, I just keep telling myself, ‘It’s Jesus who wants me to be there, and if Jesus wants me to be there, I don’t want to be anywhere else,’” Bishop Edwards said. Bishop Edwards was Iona College, Lindum rector from 2010.